This is a Yantra, which is said to give success, fame and wealth to someone who wishes to start a Newspaper, magazine, publication or a website. This is a very special Hindu Yantra and is a rare and unique Indian Voodoo Spell. Given below in this post is the method of putting this Voodoo Spell into actual practice for the purpose of becoming a publisher. The Yantra can be prepared on any day. It has to be prepared as shown in the image using the mixture of Gorochana [an animal part available in most shops selling Tantric items in India], Kasturi [Powdered Musk] and Kesar [Saffron] all three in equal parts as the ink. It has to be drawn on a Bhojpatra using a pointed wooden stick as the writing instrument. 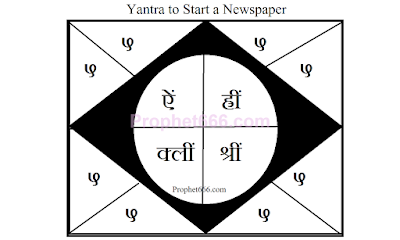 The prepared Yantra should be put in a Glass Photo Frame and hung in the office or the place where the publication business is being carried out. The Yantra should be worshipped everyday by lighting an Incense Stick in front of it. Even though, it is not mandatory the practitioner can chant a Laxmi Stotra or Mantra of Laxmi, you can find numerous such Mantras and Prayer of Laxmi in this post – Here. Note- This is an auspicious and pure Yantra experiment and will only give fame, money, popularity in society and success to the practitioner, if the business is carried out in a clean and honest manner. I would like to start a publication either print or internet based. But I have difficulty in procuring and creating this yantra. can you help me get one from a reliable source?